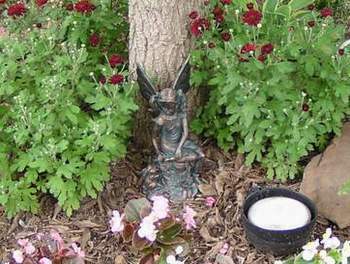 On this page are some photos taken of the garden over the course of 10 years, from 1994 to 2004. This is just a small garden, 160 feet long but only 25 feet deep. 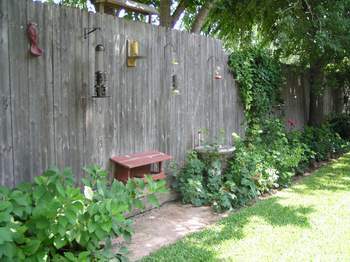 It is also certified as a "Backyard Wildlife Habitat" with the National Wildlife Federation and a "Texas Wildscape" with the Texas Parks and Wildlife. Here the grass has been removed from the beds and a few starter shrubs in place. The far corner is where eventually the pond was to be put. It had a natural slope which lent itself well to a small waterfall. Four years later the beds are matured, the pond fills the far corner and the yard has a lot so much more color compared to the bare weed-filled lot we moved into. However, even since this photo was taken the garden has changed dramaticaly. Trees have grown giving more wanted shade and plants are slowely being replaced with shade loveing varieties. As the years passed light conditions changed a little, the beds becomming a little shadier but still getting part sun. 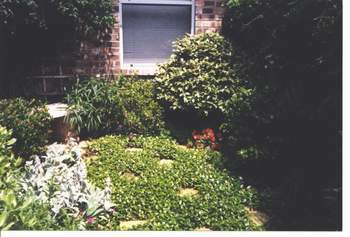 Many shrubs were changed accordingly but natives and Texas adapted plants were still used, preferably ones which attracted hummingbirds. Even this area has changed since the photo was taken. Plants grow so fast down here everything has matured and become shadier and the plants have reached the top of the fence. 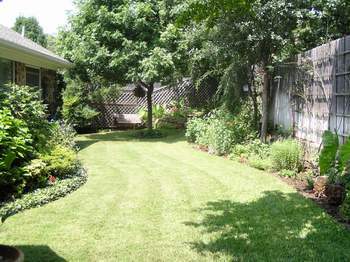 This is just a small area tucked away around the side of our house that I call my "Secret Garden"! 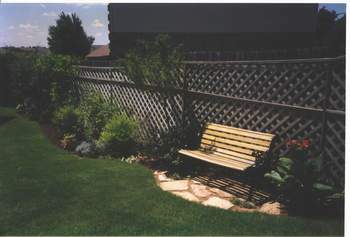 It has a small stepping stone walkway leading into it through an arch before opening up into this 10x12 secluded area. We spent many weekends going back and forth lugging these rocks to build up the front of the pond but they would provide many places for tucking in plants and for critters to make homes in. 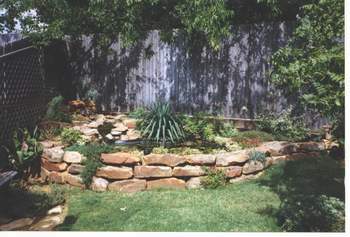 The pond is a pre-formed shell and there are two smaller pools with a liner base that flow into it. These are shallow enough with stones for birds to bathe in. A filter (not really seen on this photo) is at the top back corner of the pond out of view. It is a biological filter. Plants have grown a lot since it was put in and toads have moved into the rock crevices! Lizards warm up on the sun heated rocks and dragonflies and damselflies come down to the water to lay eggs. 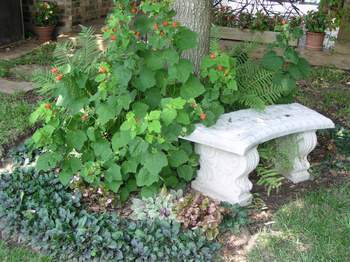 All the plants are now full grown & consist of shade plants such as ferns & columbines. Lilies cover the surface of the water which really keeps the water cool & clear, as well as protecting fish from the eyes of predators. I use native lilies as my pond runs all year and the plants just die back over winter, returning stronger each year. The ones here produce yellow and pink flowers. As you can see, the pond does have trees above it (Oak and Hackberry). 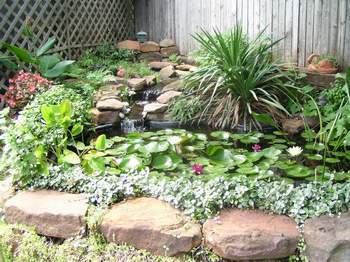 Ponds do not HAVE to be in full sun. 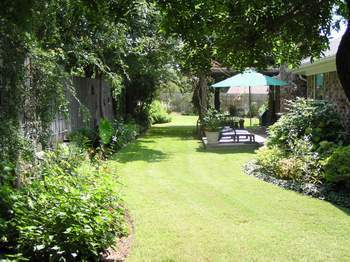 In my opinion trees do not cause any problems so long as your filter is working properly and by not considering a shady spot for a pond in your yard you will be eliminating some of the best places. In the fall I cover the pond with a simple net mesh and leave it on till around February. This pond does get some sun toward the front. We spend so much time out here. 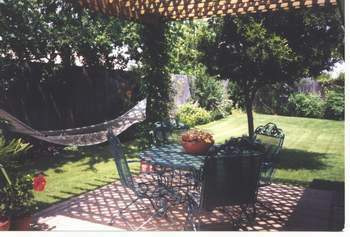 Its so peaceful back and cool with the vine covered trellis above. It also gives great views of the birds visiting the feeders, or in the other direction, my martin house. A good hummingbird attractant, in the summer the trumpet vines completely cover the top of the trellis and hang down all around like a curtain on a four poster bed! I can lay in the hammock and watch Ruby-throated hummingbirds come to the flowers just a few feet over my head. Their whole bodies almost fit inside the flowers! In the winter the vine loses its leaves which lets more light into our house needed during the winter months. In spring it leafs out, giving us good protection from the hot sun by the time summer rolls around. 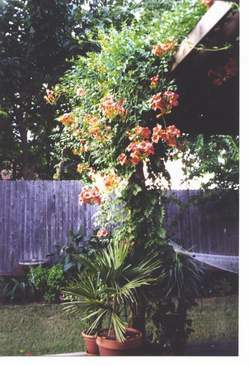 The vine is planted at the base of the two supporting columns and reaches about 15-20 feet in length, across the top of the trellis to the roof of our house. This is just a small bed but the hummers love the Turkscap flowers and will come right up to you while sitting on the bench. ... & lastly a hummingbird feeder which is replaced by a suet feeder in the winter as I keep other hummer feeders nearer the windows at that time. The ground is concrete with pave stones set in on which fallen seed is eaten by ground loving birds. A bird bath completes the setup. 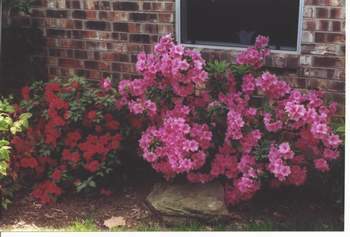 A couple of beds have azaleas in them, giving big splashes of color to welcome the Spring. After this other summer perennials and shrubs take over. 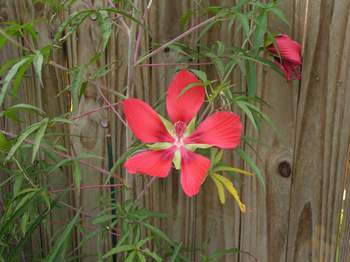 One of my favorite plants in the summer garden, the Texas Star Hibiscus are so bright & grow to 6 feet tall. This plant is native to Texas and attracts hummingbirds although may not hold that much nectar. 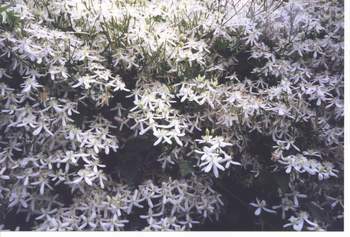 A vigorous climber, the Sweet Autumn Clematis flowers, as its name suggests, in the Fall. (actually around September here in my yard) It can be cut back to a couple of feet of the ground yet by the end of the growing season will grow and spread to 15 feet. 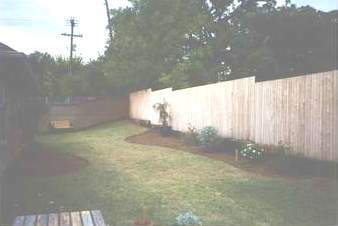 This one covers the fence in my "Secret Garden." It has a sweet fragrance and insects of all sorts are attracted to it. This plant, as with many Clematis, like their feet in the shade and their head in the sun! Planting on the North side of a 6 foot high fence is perfect. 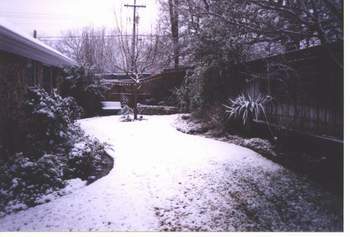 We don't get that much snow here in Texas so when it does snow its a kodak moment! 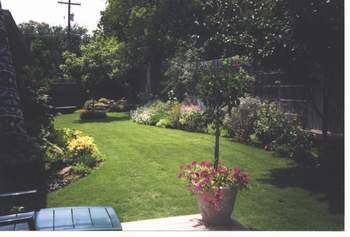 I allow everything to just die back in the Fall and do not trim, prune, or clear anything until the spring. I do this so that the birds and animals have more cover and shelter during the cold months. Sparrows hop in and out of the tangled branches to keep out of the wind and to eat the many seed heads left for them. Our winters get down to the low 20's at times but only for a couple of days. I am able to leave my water fall and pump in the pond running all winter which always helps to attract birds and wildlife, esp. if water around is frozen. I put any remaining compost onto my beds as well as all the fall leaves to help protect plants over the winter. Then I just wait till Spring arrives!